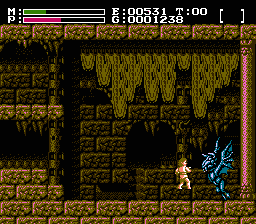 NES Faxanadu (USA) in 31:00.75 by Walker Boh. In comparison to the usual run-through platform games, this is one of the games that require more planning to play efficiently. The game features an inventory and equipment and a spells system, all of which were rare to see in NES games when this game came out. This is the second version of the TAS, now six minutes faster than the first time. The author has written comments describing all the planning and tricks that went into this movie, as well as some words of the game.